I love using my crock pot to make my life easier. Let's face it, it is a busy moms best friend after all. My son has been raving about a crock pot macaroni and cheese recipe that a friends mom made. I had tried to make one in the crock pot not too long ago and it did not turn out well at all. My crock pot tends to run a little hot and I did not take in consideration of that when making it. Please keep in mind, you will need to be around while making this so that is does not burn. Mine was done in about an hour and half. This is not the recipe to place in your crock pot and leave for the day. I always spray my crock very well before using and it always cleans up nicely. Even when I forget to wash it and it sits on the counter for a day. Sometimes I use it so much, it stays on the counter and I forget to check it and wash it. It is just like the coffee pot, it is always there and I over look it. Just keeping it real. I was a little apprehensive to try another recipe since the first one did not turn out well. I saw this recipe from a good friend of mine, Cris over at Recipes That Crock and I knew I had to give it another whirl. It does not disappoint on the cheesiness. 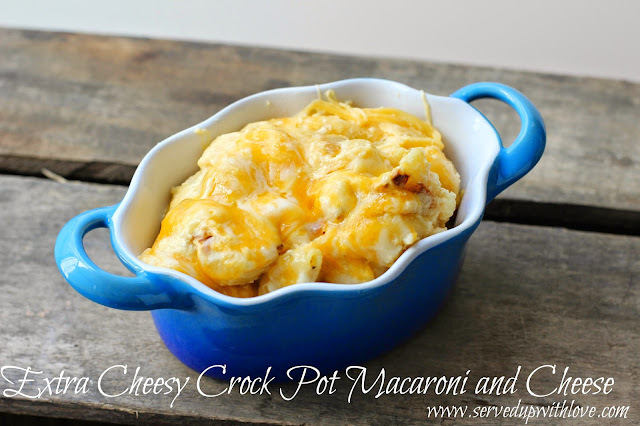 If you like a good cheesy macaroni and cheese, this is the one for you. In a bowl, combine cheeses and set aside. In a different bowl whisk together remaining ingredients except pasta. Add pasta and 3 c. of cheese and stir well. Pour mixture into a lightly greased slow cooker. Sprinkle with 3/4 of the cheese. Refrigerate remaining cheese. Cover and cook on low for 1-4 hours (depending on your crock pot) until cheese is melted and creamy and pasta is tender. Optional: Sprinkle servings evenly with remaining cheese. Or place cheese on top of the mac and cheese and allow to melt before serving. Cook times vary depending on your slow cooker. Please watch closely until you learn how fast your crock pot cooks up this recipe. Mine took about 1 ½ - 2 hours to cook. This recipe was shared in a recipe issue of Chesapeake Style Magazine in my Served Up With Love in Style column. I am currently making this dish and I am about an hour and 30 m in, the pasta seems mostly tender, aldente, but there is still A LOT of runny sauce. Should I just be patient or turn up the heat to high?? So sorry Crystal I am just logging on and catching your question. This will be a creamy mac and cheese and extra cheesy. Mine was done pretty quick and in about the same time you are describing. I hope it turned out well for you. My husband and son do not like mustard so I try not to use it in some dishes, especially if I am unaware if it will be noticed. Next time I make this I will try it. Thanks for letting me know you do not notice it at all. Thanks for stopping by. My favorite addition to my crockpot mac n cheese is to put RITZ crackers on top in the last 15-30 minutes and leave the lid off. This might help if it happens to be runny toward the end of cooking, too. That is a great idea Julie, thank you so much. The next time I make this I am going to try that. I bet it is super good! Thanks for stopping by! When I made this dish (it was delicious btw) I had to cook it for 4 hour s in order for all of the liquid to evaporate. Well worth the wait and yes you cant taste the mustard. Hello, my grandmother really loves your blog and lost your crockpot recipe for Mac n' cheese with French onions and was wondering if you could please. repost it or something so she could have it again? Can you use a different pasta, such as elbow macaroni? Making this Mac'n Cheese for the second time. Mine takes about 2 and 1/2 hours on low because I like a little crust on the bottom. Also love it reheated and to serve stewed tomatoes with it! Yum!! Is the pasta cooked already? The pasta is added uncooked. Thank you! You are awesome for answering on Thanksgiving!!! Have a Happy Thanksgiving! The casserole crock pot is the size of a 9 x 13 inch casserole dish. Depending on how big everyones appetite is, you made to make extra. Hope that helps.